DR. SUSIE OH is thrilled with new developments. If you live in the Hancock Park area, even if you don’t have kids, you most surely know that Third Street Elementary is one of the top-ranked public elementary schools in Los Angeles Unified School District. In fact, with an Academic Performance Index of 948, the school places in the top two percent of all public elementary schools in Los Angeles. Third Street, filled with 750 kindergarten through 5th graders, has long held a reputation for having a diverse student body, high academic achievement and an abundance of parental involvement. This is no accident. The woman who has been leading the school since 1993, Dr. Suzie Oh, is determined not only to keep it at its current level of academic success, but to boost it even higher. With the introduction of the new Common Core State Standards phasing in this fall (a U.S. education initiative that seeks to bring diverse state curricula into alignment with each other), Dr. Oh sees lots of opportunity for progress. 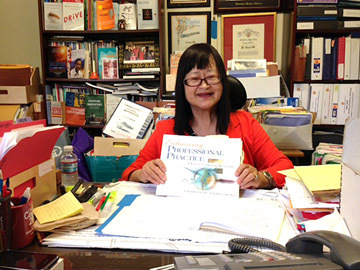 The principal doesn’t flinch when she says that, but the reality is that over her last 20 years at Third Street, Dr. Oh has been faced with the constant winds of academic change throughout LAUSD. The one thing that has stayed consistent is her knowledge of what works and what does not. Most recently, Secretary of Education Arne Duncan approved a one-year waiver that releases LAUSD from its obligation to No Child Left Behind. Dr. Oh is thrilled with these new developments. This waiver is “transformative change,” she explains. “It provides an incredible opportunity to take a more holistic approach to school improvement. This will allow us to be far less dependent on a single test score. Dr. Oh has managed to put her own stamp on improvements at Third Street. For example, when she became the principal in 1993, the first thing she did was to enlarge the library. “The school had a very small library when I started, and libraries, in my opinion, should be the center of learning… we wanted to instill the love of reading in our students. Today’s readers are tomorrow’s leaders,” Dr. Oh states with confidence. With devastating budget cuts affecting the public schools year after year, one of Dr. Oh’s main priorities was to get the parents involved in fundraising and volunteering. In this way, the school, through “Friends of Third,” has raised enough money for library support, teacher assistants, P.E. classes, the Arts and more. Dr. Oh also introduced a Korean/English dual language program 12 years ago, and expanded the Gifted and Talented Education program (GATE) at the school. “When I first arrived, only three to five percent of the students were originally identified as gifted and talented. Now, there are about 20 to 25 percent who are in the program,” she says with pride. Twenty years after Dr. Oh’s arrival at the school, Third Street Elementary is moving forward with bold programs, lots of parent involvement, and a laser focus on improving every child’s life.